Say the word “poetry” and your students cringe (and admit it – some of you do too.) Teaching a successful poetry unit begins with a solid introduction, but here’s the good news: there are many ways to start, and none of them are any better than the others. What you’ll find below are several of the most successful ways to ease your students into your poetry unit. On top of that, you can mix and match these introduction methods to suit the students you are teaching and the amount of time you have to devote to kicking off your poetry unit. While the basics are important, DON’T START HERE! Density: Condensing ideas into few words, sometimes as few as possible, but always into the best words possible, according to the poet. The line: The first and last words, and should the line be enjambed into the next line or ended with a comma, semicolon, or period. Not rhyming – at least not for the past 200 years unless they are writing rhymes for children or writing in a specific form that requires rhyme. Free Verse has been the most popular form of American poetry since Walt Whitman, who lived from 1819 – 1892, wrote in lines that were so long that they did not fit on the page. There were others before him (in France and in the King James Bible), but Whitman is the poet who broke the mold in America. Free Verse, as described by Poets.org: A poetry of organic rhythms, of deliberate irregularity, improvisatory delight. Snapshot: Poems that describe a static scene, object, or person. Movie: Poems with movement and take the reader from one place to another or from one time period to another. Story: These poems tell a story, sometimes in chronological order, but sometimes with the chronology mixed up. Reportage: Almost like a news article, these poems retell the story of an actual incident; these poems may or may not be entirely objective. Experience: The story of a personal experience and the thoughts that accompany it. Serious: “Echo” by Christina Rossetti – A Poem about a dream in which the speaker longs to dream about a past loved one who is no longer alive. Humorous: “Eletelephony” by Laura Elizabeth Richards – It is this poem’s made-up words and silly rhymes that makes this poem of light verse humorous. The TED video, “Everyday Moments Caught in Time”, features the extremely popular former poet laureate Billy Collins as he introduces 5 of his poems that have been animated. He recites his poems while the videos – each one different and each appropriate for high school – play. Included in the 15-minute video are his poems “Budapest”, “Some Days”, “Forgetfulness”, “The Country”, and “The Dead” plus Collins reading a humorous poem that you can use to teach tone (since it is dripping with sarcasm): “To my favorite 17-Year-Old American High School Girl.” Ask students to describe the humor in each of the videos and select the one that speaks to them the most. NOTE: At 9:05, Billy Collins mentions that he taught his uncle “smoking and drinking”. If that is inappropriate for your students, you can skip over it. A HEADS UP: Just in case you happen to see the TEDTalk video “Two poems about what dogs think (probably)” when you are showing the one described above: In the video, a dead dog talks about “unmanning” his owner. This content may not be appropriate for high school students, although it is likely completely fine for the college level. So many students believe that poems 1. have to rhyme and therefore are constructed of multiple couplets or quatrains, 2. must be centered on the page or aligned to the left margin, and 3. require punctuation and capitalization like traditional prose. I like to challenge these misconceptions by showing them that poems that many shapes and forms and often bend or break the rules of standard grammar in order to convey their message and create the desired effect on their reader. A low-risk and fun activity to introduce poetry to your students is to use a poetry bell ringer. I use Poetry Bell Ringers with Analysis and Writing Responses for Teens, a set of 21 bell ringers that I created for my own sophomore and junior students. I selected short, accessible poems (and excerpts from a couple of longer poems) and paired them with beautiful, colorful images that really appeal to teens. Each of the 21 poem slides asks students to RESPOND to the poem in a variety of ways; ten of them are paired with a second slide that asks students to ANALYZE the poem. You can use any of the 21 poems for your introduction and then return to the analysis slides later on in your poetry unit if you want to. I suggest that you peruse the poems and select the ones that you think would work best for your students’ ability levels and for the time you have on any given day (While the short poems are quick to read, the longer poems take a bit more time to work with, of course.) Regardless of length, I read the poem and the prompt to my students and give them three minutes to write a response. Then I allow students to share what they’ve written with a shoulder partner first, and then with the class. The entire process can be completed, start to finish, in approximately 12 minutes. I also tell my students that we’ll do our best to respond to all of the writing prompts in the course of our poetry unit which paves the way for using these “bell ringers” anytime during a class period. I especially like to bookend a class with one at the beginning and another at the end. Doing so provides a solid introduction to the class and closure at the end. You have three options with this idea. Option 1: Play the 2:30 minute audio you’ll find at the top of the post when you click on the link and listen to the backstory behind the hashtag that NPR posted on Twitter and the tiny poems that were tweeted as a result. Option 2: Read and play some of the poems in the body of the post. My favorites are those by Heather Kohser (including her last hashtag), Shelby Boehm, Mike Cecconi, Kathleen Gresham Everett, Susan Crane, Tommy Welty, and Yahia Lababidi. Check them out and the others featured in the segment. You may find others that you like better. Option 3: Do both! What’s cool is that the introductory audio and all of the poems are completely appropriate for high school, while several may work nicely for middle school students. Allow approximately 20 minutes for this option. 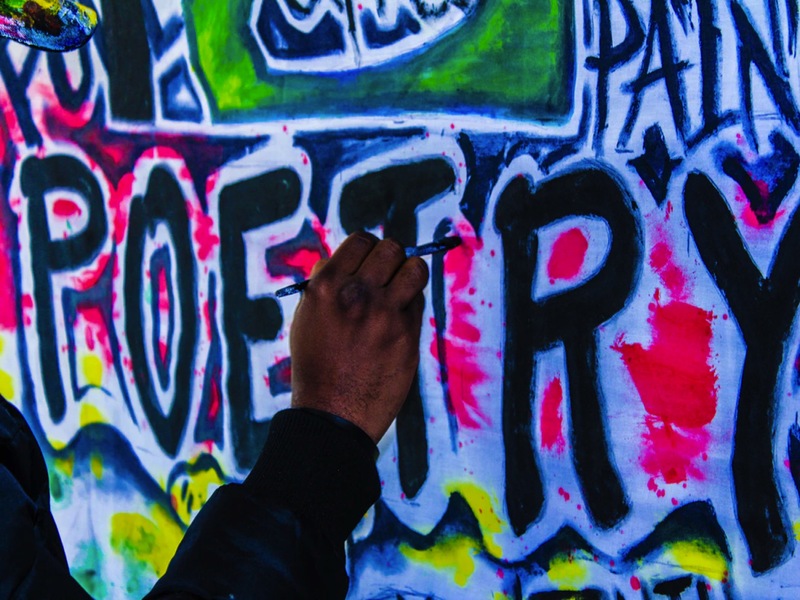 With these five methods to introduce poetry, you’ll be able to start your poetry unit off with high student interest and engagement. Here’s to mixing and matching! Can you use one of these methods and skip the rest? Of course! Can you use them all? That works too, if you’ve got the time or if you only “sample” a bit – two or three ideas – from each of them. No matter what you do, be prepared for students who grumpily acquiesce to your requests for participation to begin to come around and see the light. Poetry, after all, is truly magical. It just takes a skilled and patient teacher shining a flashlight on the darkened path to lead the way. Go you!